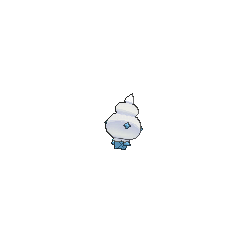 Vanillite in game: 5,459 Who? Important notice! Pokemon Vanillite is a fictional character of humans. Vanillite (Japanese: ????? 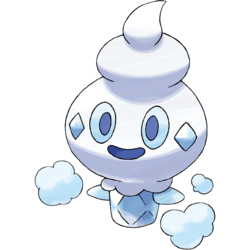 Vanipeti) is an Ice-type Pokémon introduced in Generation V.
Vanillite heads are covered with something resembling a swirled scoop of vanilla ice cream. Beneath this lies its actual head, which is made of the same icy material as its body. It has dark blue eyes, a dark-blue mouth, and light blue crystals on its cheeks. Its small body is adorned with specks of ice and has stubby arms. 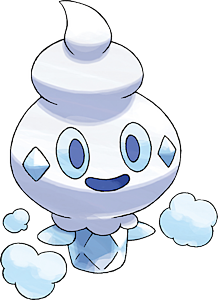 The snow on a Vanillite's head can melt with heat or repeated touching, leaving it with a "bald" appearance of simply an ice creature. In the Japanese Pokédex 4-coma, it becomes embarrassed if seen in this state. 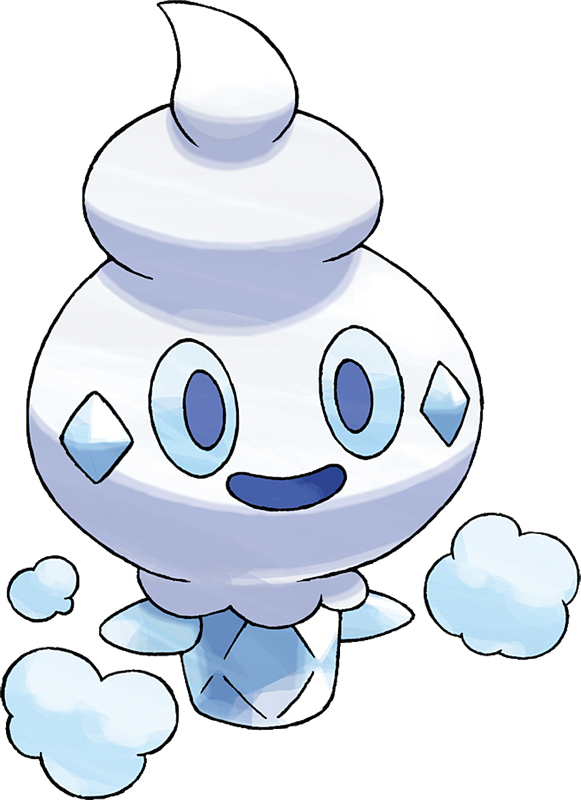 Vanillite can blow winds as low as -58 °F (-50 °C), which causes it to compose ice crystals and make it snow in nearby areas when it exhales. It sleeps under snow and gains energy from the morning sun. A Vanillite first appeared in Ash and Trip's Third Battle! under the ownership of Trip. It was used to battle a wild Palpitoad and later it battled against Ash's Tepig, where in the end they were both knocked out. Two Vanillite were used by Cryogonal Man's henchmen in The Mighty Accelguard to the Rescue!. A Vanillite appeared in Cilan and the Case of the Purrloin Witness! under the ownership of Teaque. It was used in the Marine Cup Tournament where it defeated Iris's Axew in the first round. 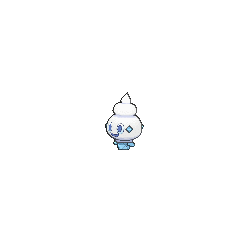 A Vanillite appeared in Thawing an Icy Panic!. It had been separated from a Vanillish and a Vanilluxe, during their journey. This Vanillite was taken care of by Nurse Joy in Coumarine City. A Vanillite owned by Malin appeared in Kyurem VS. The Sword of Justice. BW031 Vanillite Ash's Pokédex Vanillite, the Fresh Snow Pokémon. Vanillite's breath is more than fifty degrees below zero when it exhales, composing ice crystals and causing it to snow. XY057 Vanillite Serena's Pokédex Vanillite, the Fresh Snow Pokémon. Vanillite is breed from ice crystals that are illuminated by the morning sun. Its breath is 58 degrees below zero. 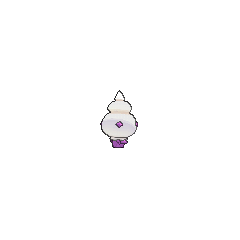 Vanillite makes a cameo appearance as one of the Pokémon employed by the BW Agency. A Team Plasma Grunt used a Vanillite during the attack on the Cold Storage. It could use its ice to compose a maze of mirrors. The temperature of their breath is -58° F. They compose snow crystals and make snow fall in the areas around them. The temperature of their breath is -58 degrees Fahrenheit. They compose snow crystals and make snow fall in the areas around them. According to Game Freak, Vanillite and its evolutionary relatives were drawn by James Turner. 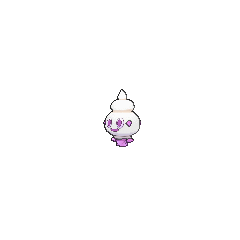 Vanillite appears to be based on a snowball and a small scoop of ice cream. It also resembles a child's size ice cream in a cup. Vanipeti may be a combination of vanilla and petite (small). Mandarin Chinese ??? Mínibing Literally "Mini ice"